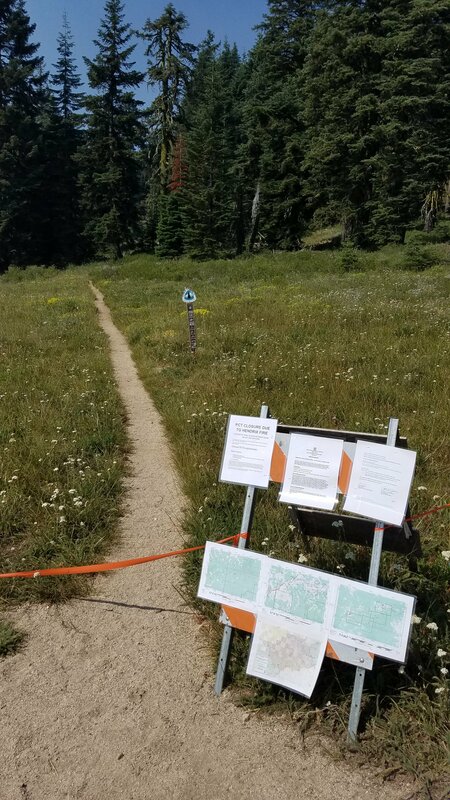 The Pacific Crest Trail fire closure near the Northern Terminus has been reduced to 17.5 miles, from near the Slate Peak Lookout (mile 2,623.6) to near Woody Pass (mile 2,641) in Northern Washington, and a new detour exists for NOBO thru-hikers trying to reach Canada. The Pacific Crest Trail Association posted news of the reduced closure on its website, and provided an alternate route of 21.5 miles to reach Canada. The fire burning in the Pasayten Wilderness is among many that are prompting closures of PCT sections in California and Washington, with smoke shrouding thru-hikers in a haze. 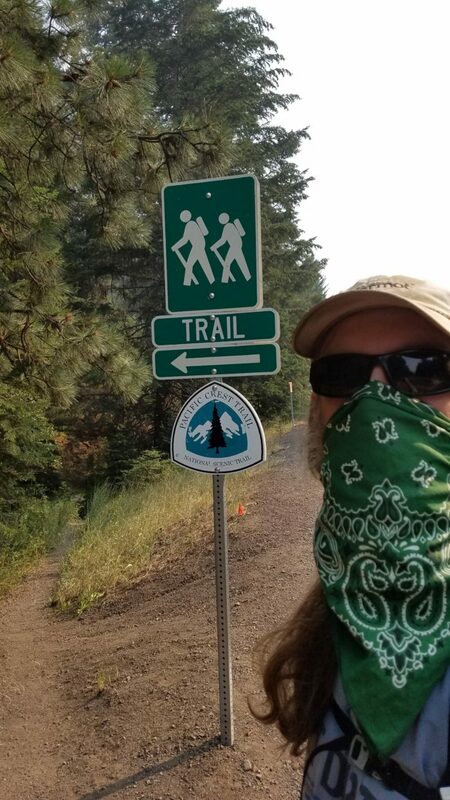 “The smoke is getting kind of bad, ruining the views, and maybe our lungs?” NOBO thru-hiker Smokebeard posted on his Trek blog. Smokebeard on the PCT north of Ashland, where smoke from wildfires is pervasive. Read his blog here. Here are the latest closures, reopenings, and advisories posted by the Pacific Crest Trail Association on its website. Hirz and Delta fires near Castle Crags: The PCT is open again after closing for 55 miles from Ash Camp (mile 1471) northbound to the Gumboot trailhead (mile 1,525) near Mount Shasta, CA.Murphy Fire near Belden, CA: PCT reopened after being closed for 44 miles from Highway 70 at Belden (mile 1,287) to Highway 36 (mile 1,331). The fire is burning on the north side of the Feather River Canyon and Highway 70 on Plumas National Forest. Hat Fire near Burney, CA: The fire is burning near the PCT, and the PCTA advises that hikers use caution while passing through the area. Bannock Lake Fire, north of Suiattle Pass, WA: The PCT is closed from Suiattle Pass (Halfmile Point 2,552) to High Bridge (Halfmile Point 2,572). The area is also closed to all recreation users. Miriam and Clear Fork fires in Goat Rocks Wilderness, WA: The PCT is closed for 16.5 miles from Elk Pass (mile 2,278.5) to White Pass at Highway 12 (mile 2,295). The Miriam Fire is burning just to the east of the trail. The Clear Fork Fire is burning to the west of the trail. The PCTA has posted detour information. Donnell Fire, Stanislaus National Forest, CA: The PCT is now open between Highway 108 at Sonora Pass (mile 1,017) and Highway 4 at Ebbetts Pass (mile 1,048). Cranston Fire, outside Idyllwild, CA: The PCT is closed near Idyllwild, north of Highway 74. Mount San Jacinto trail and area campgrounds are also closed. The PCT was closed outside Ashland, OR, for several days because on the nearby Hendrix Fire. Photo provided by Smokebeard. The fires affecting the PCT are among many burning across the West this summer that have claimed lives and destroyed homes. Cal Fire has a map on its website showing current wildfires in the state. The US Forest Service said on its website that hot and dry conditions continue to fuel fire activity throughout the country. The majority of the large fires are burning throughout Colorado, Idaho, Oregon and Texas. The fires come on the heels of one of the worst fire years in decades. By the end of 2017, an area more than three times the size of Connecticut lay charred in the second-worst year since the early 1950s, according to the New York Times. East of Portland, OR, a portion of the Pacific Crest Trail burned on for three months through the steep terrain of the Columbia River Gorge National Scenic Area, the Times said.